Your accommodation in Sydney should be as iconic as the city itself. Whether you’re here for a family holiday or a business trip, you deserve to immerse yourself in decadence. If you’re ready to experience a stay like no other, Meriton Suites World Tower will soar above your expectations, every time. As Sydney’s tallest hotel, ascending at 77 levels tall, you’ll be spoilt by spectacular views and luxury living in an unrivalled location. The toughest part of your trip will be deciding which suite to choose. It’s all in the details. Each suite has been meticulously designed to provide an extraordinary experience. With all suites located on the top 17 levels of Sydney’s tallest hotel, unparalleled views of Sydney’s stunning skyline will greet you from every window. Featuring large living and dining areas, gourmet kitchens, plush bedding, and internal laundry with washer and dryer as well as designer bathroom amenities in partnership with KEVIN.MURPHY, you’ll have everything you need for a glamorous stay – in your home away from home. But that’s not all. All suites include a full second bathroom as well as HD flat screen TVs in the living room and all bedrooms, complete with a range of Foxtel sports, news, movies and documentaries. If you choose one of our 115 extravagant suites, the impeccable apartment-style layout delivers the perfect combination of comfort and grandeur. The suites are spacious, up to three times larger than a typical hotel room with modern furniture and every convenience you could dream of. Views of Darling Harbor from the Darling Suites, or the sweeping oceanic backdrop with our Ocean Suites, further compliment this amazing accommodation option. Take your stay to the next level – literally – by choosing one of our Penthouse Collection Suites. Located on the upper levels, these three bedroom, two bathroom penthouses are the definition of indulgence. It’s not just the finest of furnishings of luxury bathroom amenities that’ll impress you. It’s the noteworthy details like your own Nespresso Creatista coffee machine, GHD hair straightener, and in-suite telescope that really make it special. Our Penthouse Collection allow you to witness the city like never before with panoramic views from floor-ceiling glass windows from the top levels of Sydney’s tallest hotel. At night time as you watch the vibrant Sydney come alive, the jaw-dropping backdrop will take your breath away. If this isn’t the best view of the most beautiful city in the world, then it’s pretty close. Our award-winning penthouses provide a magical experience, incomparable to anything else. Feel like a workout or a nice big swim? Head to our Level 61 sky-pool and fitness centre to work out and overlook Sydney City at the same time. If you require any help or have any questions during your stay, talk to our exceptional Guest Services team, who will go above and beyond to deliver an uncompromised service at every interaction. Our prime location is in the heart of Sydney and moments away from shops, world-class cafes, restaurants and tourist attractions. Take a short stroll to the sensational Darling Harbour, Haymarket or Sydney’s Chinatown. Explore a little further and you will discover Pitt Street Mall for the ultimate retail therapy destination. Take in the luscious grounds of the Royal Botanic Gardens, meet and greet Australian animals at Taronga Zoo or go for an adrenalin-filled adventure at Luna Park. Whether it’s the location and views that captivate you. Or the 5-star service, exceptional facilities or luxurious suites that make it so memorable. 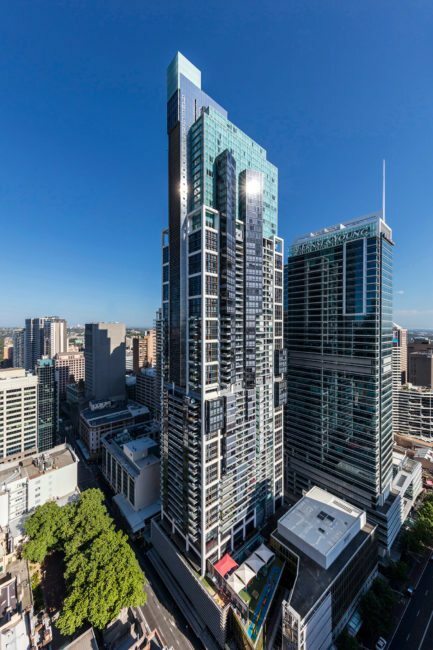 A stay at Meriton Suites World Tower is not just a stay at a hotel, but a destination in itself. Whether you’re a Sydneysider, visiting from out of town or an international guest – your stay with us will allow you to be treated to s stay in Sydney that will create lasting memories for a lifetime.